Development and Cooporation recently published an article “Sustainability requires fair wages” on how researchers find that fair payments are necessary for sustainable economic development. The article addresses the issue that wages do not match the living costs as a preventive of economic development in developing countries. The solution is clear: ensuring living wages. But as simple as it is to define this solution, implementing it seems to be highly complex. Adding these extra costs in the production stage will ultimately affect the retail prices. With a consumer demand for cheap products, companies are pressured to minimize production costs to maximize profits at the expense of humanitarian and green development. In this way, there is a discrepancy between the business sector and the development sector. The two sectors are separated areas with conflicting interests. But it doesn’t have to be as such. The Fair Trade movement has worked on this problem with this solution for years. It is what the movement calls “trade, not aid”. As it indicates, Fair Trade focuses on achieving sustainable development through trade and hence through the business sector. It aligns the two areas and creates an effective approach to save people and the planet. This gives companies a way of differentiating themselves and creating a competitive advantage. This is a win-win situation where everyone is a winner and nobody has to suffer at the expense of others’ incomes and expenses. 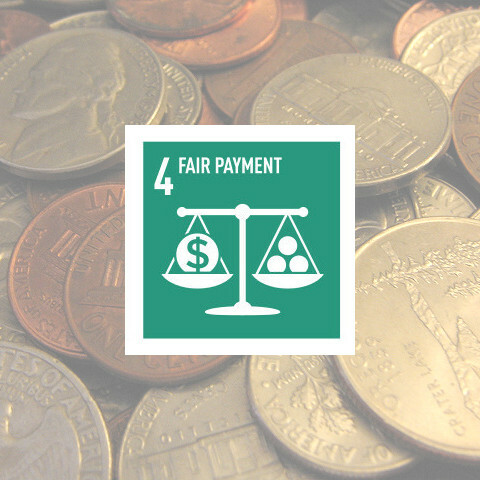 As a part of the “trade, note aid” approach, Fair Trade ensures “Payments of Fair Price” as Fair Trade Principle number 4. This is just one out of 10 Fair Trade Principles that the movement works with to achieve sustainable development. Being a member of the Fair Trade movement, such as labelling products with the WFTO logo, provides a competitive advantage to companies. When companies become members of WFTO, they go through our guarantee system which 100 % guarantees that they are Fair Trade organisations. This works because there are world-changing consumers out there who strongly ask for ethical products. They choose Fair Trade certified/guaranteed products even in those cases where this means a slightly higher price (but also a higher quality). In this way, Fair Trade companies and Fair Trade consumers give a little extra of themselves to the rest of the world for a huge impact. We are all linked. Any decision you make can be affecting others around the world. So help us in our fight for a fair world for everyone by joining or supporting our movement. Every little effort makes a difference.